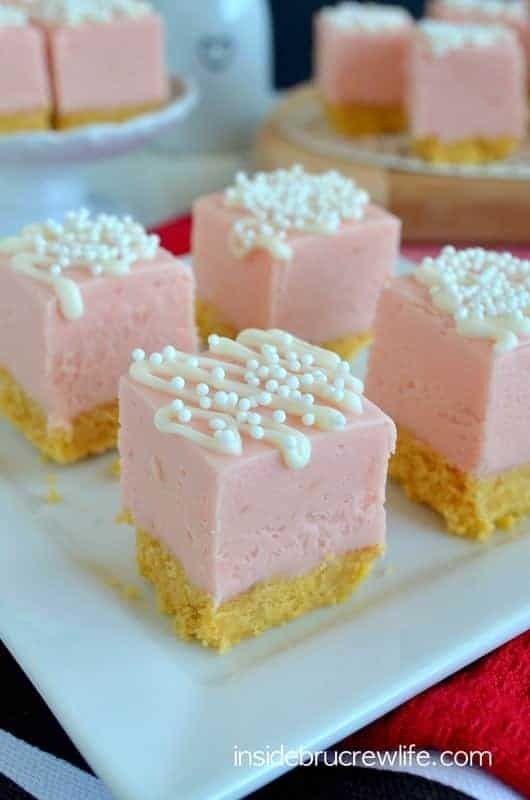 A cookie crust and white chocolate drizzles makes this Strawberry Shortcake Fudge a fun no bake dessert for any party! Yes, you get to stare and drool at at this yummy fudge, and wonder why I am so mean every day to torture you with delicious food. But that isn’t what makes today special. Today we are surprising one of our best blogging friend with a virtual baby shower. We love you, and we are so excited to help you welcome your sweet bundle of joy into the world. I wish we could all be there in person to give you hugs and yummy treats! I “met” Mandy about two years ago when I decided to start posting just recipes here on this blog. I think I found her yummy food blog through a link party. She was always so sweet with her comments and made me want to keep coming back to her blog. She also hosts a fun Tuesday link party where you can share your food posts. Make sure you stop in and say hi to her and let her know I sent you. I had so many ideas on what I should make for the shower today, but I finally decided on some fudge. Because everyone loves a good fudge recipe…and because I bought most of the stuff a while ago. Have you tried the Duncan Hines Frosting Creations yet? They are perfect for mixing into melted chocolate and creating fun new flavors. 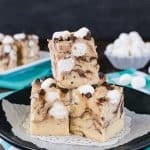 So far I have made this Mocha Mallow fudge with it and this Caramel Hot Chocolate fudge with it. Today though, I wanted a fun girly treat. This Strawberry Shortcake fudge turned out so pretty and pink. The perfect treat to share at an all girls get together or an all girls virtual baby shower. 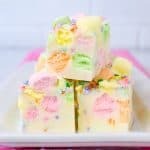 I love how easy this fudge is. You start by melting down the chocolate chips with the butter and milk. Then stir in your flavor and marshmallow cream. That’s it! 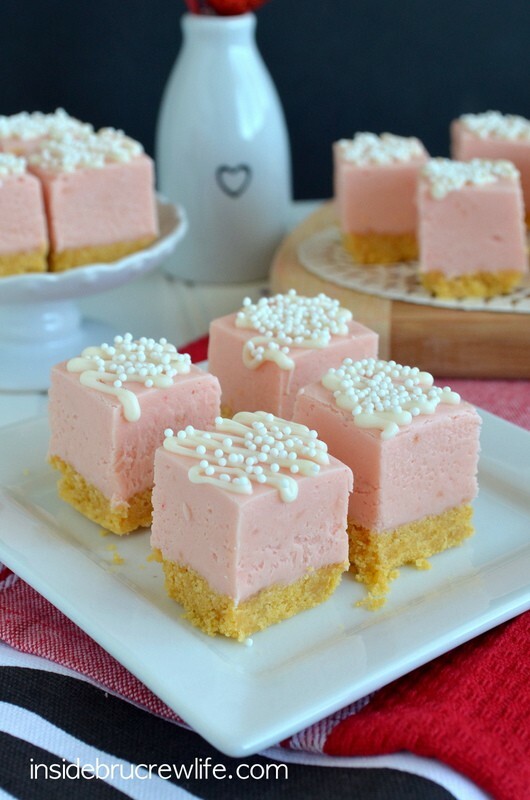 Of course since it is Strawberry Shortcake Fudge, I had to include a shortbread crust…otherwise it is just plain strawberry fudge. There is nothing wrong with that, but I wanted it to be a little bit fancier to share at the shower. Give it a fun white chocolate drizzle and some pretty white sprinkles for an even fancier presentation. Word of warning: Don’t let your plate of delicious pretty fudge sit on the counter if you have a dog that likes to steal food. We came home Saturday night and found the empty plate on the floor. Congratulations Mandy! I can’t wait to see pictures of your new boy or girl. P.S. If it’s a boy, don’t tell him I made him pink fudge. 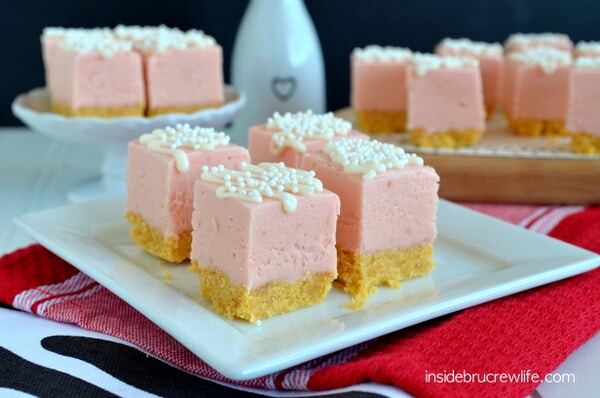 Easy strawberry fudge with a shortbread crust and a white chocolate topping. Combine the cookie crumbs and melted butter. Stir until well mixed. Press firmly into the bottom of the prepared pan. In a large sauce combine 3 cups white chocolate chips, butter, salt, and sweetened condensed milk. Stir until melted and smooth. Add the marshmallow cream and Jello powder. Stir until melted and smooth again. Pour the hot fudge on top of the crust. Let set completely in the refrigerator for a few hours. Bring to room temperature before cutting. Cut into 49 squares. Place 1/4 cup white chocolate chips and shortening in microwave safe bowl. Heat for 30 seconds. Stir and repeat until melted and smooth. Spoon into plastic bag and cut off one tip. Drizzle over fudge squares. Top with sprinkles if desired. 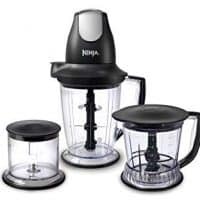 Store on the counter in a sealed container for up to 5 days. 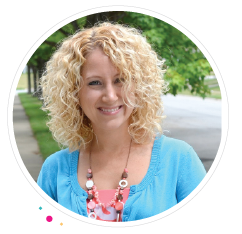 Head on over to each of these blogs and see what they made up to share at Mandy’s shower. I hope you have had breakfast, because I know each of these ladies brought their best yummiest treats for the shower today. And happy baby to Mandy!! 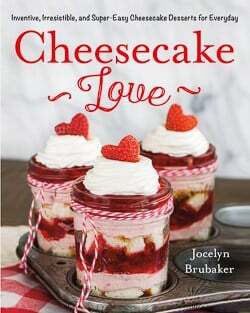 Yes, definitely make some for Valentine’s Day…I can’t wait to hear what you think!!! The crust totally makes this fudge 100 x’s better! Thank you Liz! Hugs!!! Wish I was having a baby! I’d use it as an excuse to make and then eat lots and lots of this fudge! You are the sweetest Mandy, and I am so glad to be able to celebrate the birth of your new little with you! A package of all our goodies would have been a good idea huh? HUGS!!!! Gorgeous…just gorgeous! This would be perfect for any girly event. I love the pearly embellishments! This is definitely the perfect girly treat! Thank you so much Becca! Thank you Holly!! And thank you for putting together the shower and inviting me to be a part! strawberry fudge, hmm? that sound interesting! Daggone Jocelyn! These are amazing. So creative using those Duncan Hones frosting packets!! That is just awesomeness right there. Even I think I can make these! So fun to celebrate this with Mandy!! My mouth is watering, these looks delicious! I might try to make these for valentines day for the boyfriend. Thanks for sharing!! What a fun idea for fudge. . .perfect for a baby shower! Oh my I’ve been thinking about this fudge since I saw it this morning. Totally craving some of this and LOVE that you made a crust. Goofy doggie stealing treats, I feel your pain there!!! I’m craving another batch of it too since we didn’t get to enjoy it! Stinking dog!!!! This fudge is so pretty and sounds amazing! I love the shortbread crust. I will never make plain chocolate fudge again with all of the wonderful and creative fudge recipes you’ve been posting lately. Beautiful fudge… I love pink! STOP! These are so perfectly PINK!! Thanks Katrina!! These were the perfect shade of pink too!!! I love this fudge Jocelyn! It’s so pretty. I need to try the frosting creations, I haven’t done that yet. You definitely need to pick up a few of those flavor packets. I am having a blast creating with them!!! Such a cute idea! And the fudge is almost too adorable to eat… ALMOST! Thanks for sharing, Jocelyn! Holy cow, Jocelyn, this fudge is beautiful! Love that pink color! Now you’ve got me thinking about putting some of those Duncan Hines flavor packets to use…I have quite a few of them stock-piled in my baking pantry. 🙂 Fudge sounds like the perfect way to use them! I can’t wait to see what fun fudge flavors you come up with!!! Fudge is the perfect way to get rid of those packets!!! I’m completely craving this now! 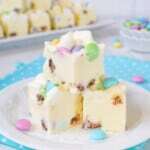 Your pictures are so cute and the fudge looks amazing! I’ll be pinning. Thank you Laurie! I am craving another batch too!!!! Oh my. This looks insanely awesome. I am just starting to get adventurous with my fudge flavors, I guess it’s time to try this one. Oh my. Thank you Miriam! Welcome to the fun and adventureous world of fudge…I can’t stop thinking of fun flavors!!! Happy Baby shower day to Mandy! These look divine! 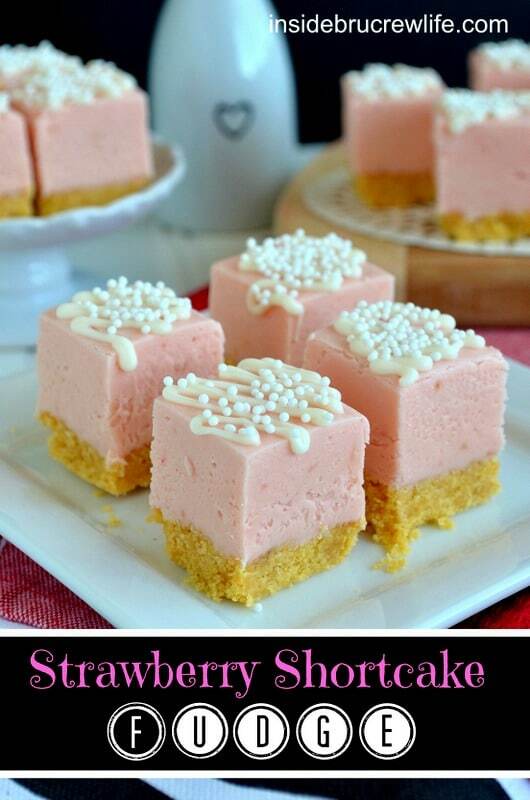 My best friend is a strawberry fiend… I will be making this for her upcoming bday! You should definitely try some of the flavor packets. So many fun ways to add them to frosting or chocolate and change up easy treats!! This sounds absolutely phenomenal!! You are so creative! :) And they are such a pretty and delicate treat, perfect for a baby or bridal shower!! These are just beautiful! Makes it hard to stay on my diet. Think I will have to make some of these for your two nieces that are currently visiting us…. and maybe I’ll have to taste them. Diet? What diet? LOL my diet is struggling these days…as are the jeans going up!!! Yes, make these for the girlies…they will love it. I think it might even be gluten free so Jessie can have some…well, other than the cookies I guess. 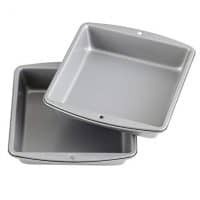 But you could make it in two smaller pans. You are such a great friend!! This fudge is the prettiest I’ve ever seen! Thank you so much Desi!!! Oh my, these look delicious! I wish I had all the stuff to make it right now!!! It is awesome…I highly recommend adding the ingredients to your shopping list 🙂 I promise you won’t regret it!!! Thank you so much for sharing Kelly!!! I’m glad you liked it! Thank you so much Wanda! I am still dreaming of how delicious this fudge was!!! these look like the best baby girl shower treat! Love the pink color! Pink fudge with a buttery crust on the bottom? Count me in! You have been counted in!!! I wish I really could share this with everyone…it was so good!!! 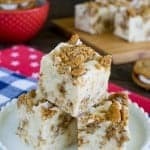 Holy moly does this fudge sound fabulous! And so pretty too. Happy virtual baby shower to Mandy. Thank you so much Carrie!!! I am so excited about this fudge for 2 reasons: 1. That it is this perfect girly pink! and 2. That is doesn’t have real strawberries. My husband has an allergy to strawberries, so I don’t necessary make a whole lot of strawberry recipes. But since this is just flavoring, he can totally partake in it! Thanks so much! And congrats to Mandy!! Yay for a yummy fudge the hubby can eat! I hope he likes it. OH.MY.GOODNESS! Your food always looks amazing. 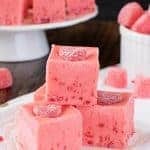 I’ve never heard of strawberry fudge before, but leave it to you! How sweet of you to share in Mandy’s honor…and at Weekend Potluck too. You are one honkin’ amazing lady and cook! These look AWESOME. I’ve been looking for something to make for a church Valentine’s day party. It needed to be something pretty and Valentine’s Dayish, and easy enough to make a ton of them. These are perfect. One question, where do you buy the Dannon’s frosting creations? By the cake mixes? I am so glad you liked it. Yes, the Duncan Hines Frosting Creations are in the baking aisle with the canned frosting. Let me know how you like it!!! This fudge looks beautiful! Your pictures are fantastic too! I am definitely pinning this for use at a future baby/bridal shower! It looks delicious! 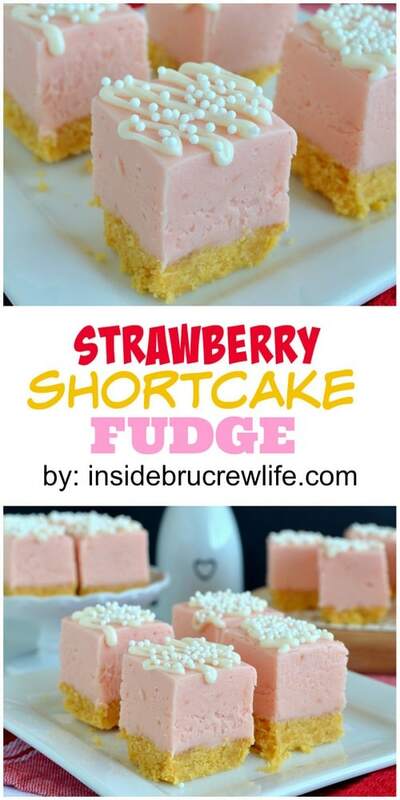 I’ve personally never tried strawberry shortcake fudge and it has an essence or resemblance of cheesecake. I will add this my top new favorite recipes this year. 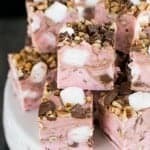 Hello, your Strawberry fudge looks absolutely wonderful, but I have never seen any Marshmallow cream for sale over here in the UK, or do you think that it could be called by another name over here??? If anyone does know how I could get some I would be very grateful to here!! Strawberries are sitting in my fridge right now! Love this fudge! Any chance of a version of this recipe not using the packets that I can’t seem to find? You could use some strawberry jello powder in place of the packets. I would start with a few Tablespoons first and see how it tastes. I think the whole box of powder would be way too much, so please add a little at a time. The color using the jello powder will be a lot brighter too. I absolutely loved this recipe. I wanted to share it on my blog with credit to you of course.